​Fulham saw their relegation from the Premier League confirmed on Tuesday night, with a 4-1 away defeat to Watford. 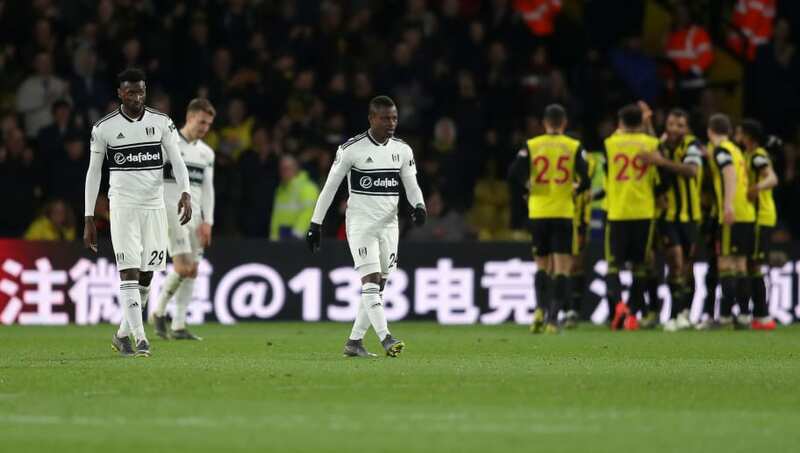 The Cottagers needed at least a draw to keep their faint survival hopes alive at least mathematically and they went into half time level, after Ryan Babel equalised following Abdoulaye Doucoure's opener for the hosts at Vicarage Road. However, ​a second half flurry from Watford, with three goals from Will Hughes, Troy Deeney and Kiko Femenia in the space of just 12 minutes confirmed what many already saw as inevitable and consigned ​Fulham to the ​Championship next season. Scott Parker's side are the second team to be relegated from the ​Premier League in 2018/19, after Huddersfield had their demotion confirmed on Saturday with defeat to Crystal Palace. In doing so, the Terriers also matched the record for the earliest ever relegation (after 32 games), with Fulham's coming just one fixture later. Parker is the third manager at Craven Cottage this season, after Slavisa Jokanovic and his successor Claudio Ranieri were dismissed by Shahid Khan and the Fulham board for poor results. Expensive summer signings including Jean Michael Seri, Andre Zambo Anguissa and Alfie Mawson have failed to gel for last season's Championship playoff winners, while £20m Aleksandar Mitrovic has arguably been the only transfer to provide some semblance of value. A woeful defensive record has been Fulham's undoing in their first season back in the top flight. The Cottagers, who have lost 12 of their last 13 Premier League games, have a league high of 76 goals conceded and a goal difference of -46. With five games still to play, the focus is now on restoring some pride and preparing for next season, with big changes expected.